A meditation told in a minor key on technology at a crossroads, mild obsessions with antiquity and the art of physical creation, cinematographer Doug Nichol’s debut documentary California Typewriter (B) is a thoughtful glimpse at the history of and current appropriation of a classic and seemingly obsolete invention: the typewriter. This quirky, QWERTY topic opens up a home row of great conversations with the likes of Tom Hanks, songwriter John Mayer and the late actor/playwright Sam Shepard, among an array of enthusiasts and iconoclasts who find a muse in the artifact with crunchy keys to peck, ink ribbons flowing black and red and a carriage return gliding with sheer powertrain force. A central narrative thread is the titular family-run business owned by patriarch Herbert Permillion, located in Berkeley, which is ostensibly a repair shop but also sometimes a blend of triage unit and curiosity cabinet for the bygone devices. Congregated less for requiem than celebration, these real people display a quiet fascination with a tactile tradition and carry the water for real-time output that pre-dated the computer era. John Mayer in particular provides some compelling commentary about lyric writing on a typewriter, free of squiggly digital lines admonishing misspellings and full of rich, pulpy texture that makes you feel amazingly alive as an analog being in a digital world. Among the series of obscure enthusiasts showcased, sculptor Jeremy Mayer (no relation to the singer) is one of the few whose obsession leaves the antique apparatus completely transformed. He breaks down his collection of contraptions into component parts to reconfigure them into anatomically correct human figures, many inspired by the aesthetic of Fritz Lang’s Metropolis; his is an intriguing take on the societal transition between the pre- and post-internet world and stands in contrast with many of the other fanboys (I guess if they’re older, they’d be fan-men) who troll museums, flea markets, swap shops and even foreign countries to purchase and preserve the classic machines. Others wax poetic with nostalgia, wit and downright fetishism about the dandy devices. Hanks prefers the Silent Smith Corona, while others rave about the virtues of a Hermes, Olympia or other company lines as if they were regaling in a car show in full glory. There have been more exciting movies featuring a typewriter at the helm (Misery, The Shining and Naked Lunch come to mind) but few make such a compelling case for a charged object at the center of a lowkey comeback. This movie about magnificent men and their typing machines makes this beast of iron giant again. Lonny Price’s documentary Best Worst Thing That Ever Could Have Happened (B+) chronicles a requiem and reunion of sorts of cast members and collaborators from the 1981 Stephen Sondheim musical Merrily We Roll Along, a show that notoriously failed on Broadway, lasting only 16 performances but that achieved cult notoriety over time, spawning some of the songwriter’s most popular tunes including “Old Friends,” “Not a Day Goes By” and “Good Thing Going.” Price, who was one of the show’s three leads and before that a fanboy in his own right, helps keep the work – a complex show about cynicism turned to idealism, told in reverse order – alive in the imagination through the documentary, unearthed interview footage and a reunion concert. While Jason Alexander may be the most recognizable of the ensemble to casual viewers, the stories of many major participants including Jim Walton, Ann Morrison and Mr. Sondheim himself serves as a bit of a reverse Chorus Line with touching personal stories. The structure of the documentary comes full circle as well as it plumbs themes about the joy of collaborating on art and the recovery from disappointment. It would have been amazing if more original behind the scenes footage were available, but it’s fairly staggering how much is discovered three and a half decades later. For musical theatre enthusiasts, Price’s fond film is a bundle of merriment. A lark gets quite dark as a fascinating story unfolds in David Farrier and Dylan Reeve’s documentary Tickled (A-). Farrier, an offbeat New Zealand journalist, uncovers an odd strain of “competitive tickling” viral videos inspiring him to plumb the depths of a mystery wormhole that takes him on an unexpected crusade around the globe. With Reeve as his Silent Bob-esque camera companion, the intrepid lead reporter displays finesse and fortitude while chronicling the giddy and gritty. In this case he may be covering the armpit of arch-villains, but there are stunning parallels to terrorist cells and cyberbullying rings that can occur when evil masterminds seduce, recruit and retaliate buoyed by the anonymity of the internet. It’s news of the unusual indeed but as absorbing as any suspense thriller this year. Cinephiles will delight in Noah Baumbach and Jake Paltrow’s documentary De Palma (A-) which is essentially a two-hour retrospective of director/screenwriter Brian De Palma’s film oeuvre told by the filmmaker himself. The auteur is lively and perceptive about his own works, with standouts and gorgeous sequences from all of his films including Sisters, Carrie, Dressed to Kill, The Untouchables and Mission: Impossible. He also shares observations about his famous flops such as Bonfire of the Vanities (he suggests the film is good if you don’t read the book). As an heir to the filmmaking style of Hitchcock, De Palma provides insights into his greatest magic tricks including continuous shots, forced perspectives, 360 captures, split screen drama and Steadicam action sequences. He addresses his controversies including accusations of misogyny and illuminates an independent filmmaking spirit from a group of iconoclasts who got their professional start in the ’70s in a way that may not ever happen again (his contemporaries are Scorsese, Coppola, Lucas and Spielberg). He also tells some fascinating stories about Sissy Spacek, John Travolta, Robert De Niro, Orson Welles, Al Pacino, Nancy Travis and a bunch of actors in his repertory. Although one might yearn for the documentary to have colored outside the lines of its rather straightforward format, it’s hard to argue with a solid story well told and with such stunning imagery and insights from a master filmmaker. The most fascinating thing about Josh Kriegman and Elyse Steinberg’s political documentary Weiner (B-) is that it exists at all. It’s not the filmmakers’ fault that their subject, New York Representative Anthony Weiner who resigned in the disgrace of a sexting scandal and embarked on an unsuccessful bid for redemption in the 2013 NYC mayoral race, proves to be so stupefyingly unsentimental. The whole story is about a man being unable to shake off a self-fulfilling narrative and the inability in the 24-7 internet news cycle to change the subject. The sunny first act presents a not completely absurd premise with spouse and supportive strategist Huma Abedin at the helm of giving her humiliated husband a second chance. Calls to donors go well, and it appears they’re turning a corner. But as soon as the words “Carlos Danger” and the real-life partner in cyber-hijinx Sydney Leathers come into the picture, it’s a battle to the bottom of the political barrel. An epic skirmish with a heckler and even a crying baby in the election booth are mounting symbols of the mayhem. The film isn’t funny or poignant enough to really stand on its own or convey any universal truths. Like its main character, it stumbles around a good bit. Huma and the political handlers all look like they were taken for a ride. The film certainly doesn’t separate the twin legacies of the man as lawmaker and lothario. It’s instructional, perhaps, about how not to live your life or to run a campaign. If the genre is cautionary tale, it gets high marks. Variety is the spice of life in a misunderstood modern metropolis for the deep-thinking but soft-spoken subject of a new documentary. Director Laura Gabbert’s City of Gold (B-) traces the impact and resonance of Pulitzer Prize-winning Los Angeles food critic Jonathan Gold as he illuminates the cultural underbelly of the city by way of its salmagundi of cuisines. It’s quickly apparent how delicacies doled out to tastebuds and tummies can awaken intellectual quandaries ranging from what immigration or the race riots have done to shape pockets of diverse populations to how exotic cooking traditions should be re-examined in the face of extinction of certain animals used for food. While this iconoclast’s superb ideas and writing crackle with energy and authenticity, the man himself is only rarely a compelling cinematic subject; and Gabbert’s hit-or-miss vision undercuts the would-be savory storytelling. Grand in its filming of mariachi bands and taco stands and bustling Korean kitchens that inspire pop-up congregations but just as often lost in the mêlée of long car rides, editorial meetings or disconnected encounters, it’s hard to fathom why the loving film craft sometimes pulses and just as often sputters. While it’s notable that the populist critic who finds wonders in strip-malls and the underlying humanity in the oddest of edibles has sketched out his own map to the stars of the everyday dinner table, the film could use a bit more verve. Still it’s a loving and enjoyable tribute. Much as Life Itself demonstrated the power of Roger Ebert’s pen to raise unexpected voices into the multiplex mainstream, the City Jonathan Gold conjures wielding chopsticks, forks and folklore is its own utopian umami. Where To Invade Next (A-) is a strange misnomer for writer/director Michael Moore’s most eye-opening and consistently accessible documentary to date, which is only tangentially about the military. In the film, the on-screen auteur stages a series of mock infiltrations into some of the great global societies to steal and stake claim to brilliant ideas and bring them back to the U.S. Sometimes a land grab and occasionally a grab bag, Moore’s trenchant travelogue transports us to schools in Finland and France, prisons in Norway, CEO roundtables of Iceland and the halls of government in Tunisia, to name just a few of his eye-opening encounters. The intrepid iconoclast of the progressive persuasion challenges all sorts of cultural assumptions and delivers plain-spoken innovations and surprising belief systems. The film is a spiritual sequel to his 2007 film Sicko in which Europeans frolicked in the bliss of their universal healthcare; but this movie is much more engaging and entertaining. Using his trademark humor and everyman interview style, he arrives at a profound thesis that many of the world’s great ideas did come from America; they just got lost a little bit on the journey. Moore speaks a little softer and carries a slightly less pulverizing stick, and it’s an entertaining and insightful lark. Those who choose to hear the provocateur’s message will be rewarded. 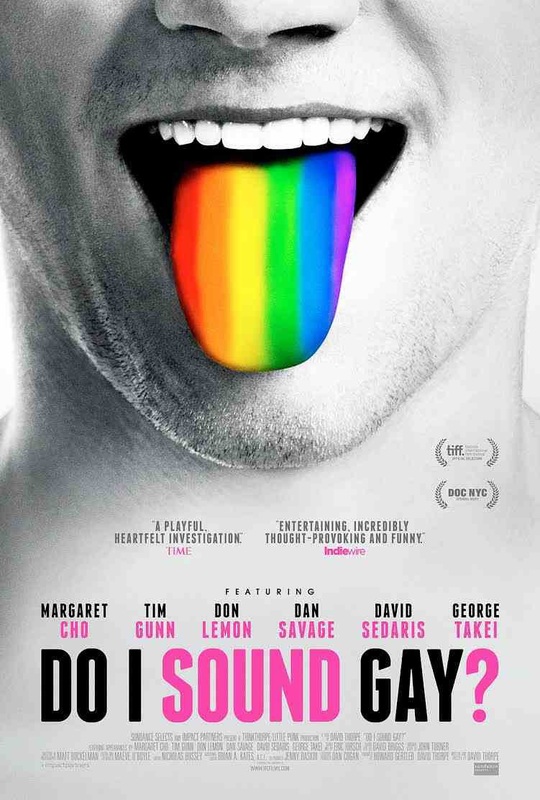 David Thorpe’s documentary Do I Sound Gay? (C-) plumbs the mystery behind why many gay men over-articulate certain letters and use clearer vowels for a longer duration than their straight counterparts. Thorpe proves a rather non-engaging central character and makes very few interesting choices in chronicling his own journey to transform his way of talking. Interviewing experts, celebrities and real-life guys and showcasing a bit of pop cultural historical context, the proceedings also prove to be a bit of a bore. Amidst all the analysis of micro variations, code switching and linguistic and psychological terminology is a half-baked message about being yourself. Perhaps the sequel will be Did I Just Watch That?